Onaway State Park is a popular Onaway area campground located only 40.5 miles from the facilities of Mackinaw Mill Creek Camping in Mackinaw City, MI. Situated on beautiful Black Lake in Presque Isle County, Onaway State Park is located in an area that was once frequented by the Chippewa Indians. Onaway State Park offers 97 campsites on 158 acres. Camping styles vary widely and many State Parks may not be a good fit for some campers. Onaway State Park varies in their accommodations, features and facilities compared to Mackinaw Mill Creek Camping, so we have gathered information on Onaway State Park and contrasted them with Mackinaw Mill Creek Camping. 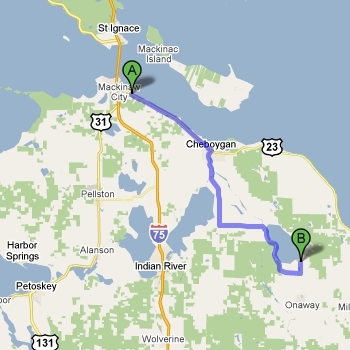 The chart below compares Onaway State Park versus Mackinaw Mill Creek Camping. Dozens of site types Onaway State Park offers 97 campsites, with electrical service available. 200 Full Hookup Sites Electrical service available. No extra fee charged for registered guests. Michigan State Park Motor Vehicle Permit required for entry. Click below for specific park info on local state parks. I drove through your campground two weeks ago and was so impressed with your facilities and the pleasantness of your employees that I immediately cancelled my reservations at Wilderness State Park in favor of your campground. Looking forward to spending time at your campground in August. SPECIAL - Discounted golf pricing* for our Play & Stay guests. Mackinaw Mill Creek Camping owns and operates The Mackinaw Club Golf Course and offers our guests discount passes. * Contact our reservation specialists for the latest details and rates. Looking forward to the Jack Pine Lumberjack Show? We have discounted tickets available at the camp office! Planning a visit to Mackinac Island? Get discounts on Star Line ferry tickets at our camp office or online when you request a reservation! We now have Bike Rentals* at Mackinaw Mill Creek Camping! Reservations by the hour, half day, full day or more at the campground. * Available to guests of Mackinaw Mill Creek Camping, Mackinac Lakefront Cabin Rentals and paid visitors. * For rates & availability, visit the Reservations area.